Anti-Trump “conservative” columnist George Will told Special Report Monday that Hillary Clinton would be better for America than Donald Trump. He added he doesn’t care so much about her Supreme Court picks. 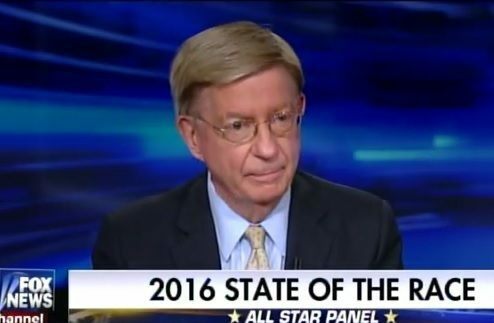 George Will: I think the Republican Party is in sort of turmoil. Turmoil can be healthy. And there are those who say we should wait and rule the rubble after November. Bret Baier: For the people who say I encourage those Republicans to not vote for Trump that you are essentially voting for Hillary Clinton. George Will: I say (a) not voting is an expression of opinion which is what voting is for. Second – Hillary Clinton for four years would be a terrible thing. It would be a terrible thing resisted tooth and nail by a united Republican Party. A President Trump vowing to double down on the executive and authoritarianism of the current president would confront I’m afraid a supine and invertebrate Republican Party. Bret Baier: For those who say you’re voting not necessarily for Trump but you’re also voting for the Supreme Court seats that this next president will put on the bench? George Will: That’s a serious consideration. And those who have supreme confidence in Donald Trump’s jurisprudence will say perhaps he should be trusted with that. On the other hand, there’s other two branches of government to worry about. I’m done with this jacka$$. ** George Will also trashed Ronald Reagan in 1987.